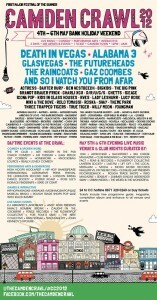 Camden Crawl 2012 – Who's going to drive you home, tonight? The Camden Crawl is on this weekend, billed as the first major festival of the summer. Anyone lucky enough to have a ticket will be getting access to copious venues and 300 acts across live music, comedy and performing arts. Rather than wasting words waxing lyrical about the sheer quantity of quality that’s going to be on show, we thought it was simpler just to stick up the poster. It’s incredible. If you’re not going, it would be ok if you wanted to shed a little tear just now. Or maybe try and get a ticket. Is your optician this cool? These prices are quoted at 1pm on a Friday, so they might be a little different at peak times (you know how it is) and destinations were taken as centre of area, where the name is on Google Maps. Download the app and try it for yourself, whenever you need a cab this weekend. Have a fantastic bank holiday weekend, whatever you do and however you’re transported.